It isn’t exactly the type of scholarly work Margaret Meserve had in mind when she chose to pursue an academic career in the field of modern European history. But it was her expertise in the Italian Renaissance and the urban histories of Florence and Rome that landed her in the somewhat unlikely position of advising a group of video game developers in the creation of Assassin’s Creed 2, an adventure game set in Renaissance Italy, where assassins, nobles and merchants battle it out for land and fortunes, all the while navigating a world of conspiracies, secrets and hidden code books. 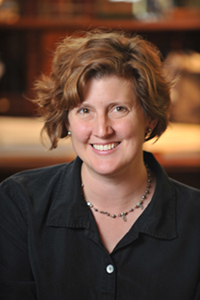 Meserve, Carl E. Koch Associate Professor of History at the University of Notre Dame, explains that the consulting job was passed along to her by a former colleague who had worked with the same company, Ubisoft Montreal, when it developed the first iteration of the game. When she got the call earlier this year, she had to smile. From there, the game developers started sending Meserve scripts containing various scenarios of characters going through different Italian cities as the story unfolded. “I’d go through and read them basically looking for anything that struck me as anachronistic or not quite right about language or dialogue, the way they had laid out the city, or anything that I thought wouldn’t have happened that way,” she explains. A mother of three, including two grade-schoolers, Meserve is not much of a gamer herself, although her family does own a Wii system. Assassin’s Creed 2 is designed for PlayStation 3, Xbox 360 and PC formats. “I found myself losing all credibility with these guys asking if they make a version for the Wii,” she laughs. And while some other faculty members may consider video games to be strictly child’s play, Meserve’s colleagues have gotten a kick out of her involvement in the project. “People think it’s fairly amusing and, if anything, they look at it the way I do, as an interesting and really different opportunity,” she says. Not too surprisingly, this kind of work has earned her some “cool points” with her students. When the game comes out this fall, her students may become even more familiar with the genre. “If it turns out to be as good as I think it’s going to be, I might use it as a teaching tool. I’ll tell them to go home and play around with it and tell me what they see when they look around the city,” she explains. Meserve’s involvement won’t be strictly behind-the-scenes. She will appear in the extra features on the game’s DVD to offer further historical perspective, her name likely will be in the credits, and there’s a possibility she may participate in a promotional tour through Italy this fall. After all that, she just might want to treat herself to a little present. “We might need another game system for Christmas,” she says. Originally published by Julie Hail Flory at newsinfo.nd.edu on July 28, 2009.